The Telerik® UI for ASP.NET AJAX offer intellisense information for the code-behind out of the box as Visual Studio automatically loads the needed information from our assembly. It can display it without any further configuration, because the type of the variables is known. With this in mind, you may want to consider writing directly in TypeScript and using the TypeScript Definitions for Telerik UI for ASP.NET AJAX. 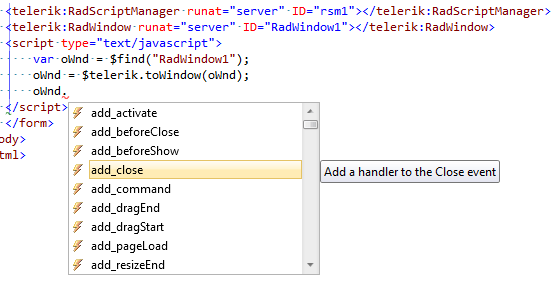 Add the TypeScript Definitions for Telerik UI for ASP.NET AJAX to your project. Use the JSDoc syntax to define the object types for the variables you will use. This includes event handler functions and control references obtained in other code. Here follows a list of several common scenarios that can help you get started with using JSDoc declarations of variables and arguments. Set type to event handler arguments. You can specify the type of the first argument (the control that fired the event), and use its client-side methods for working with its events in order to see the exact type of the event arguments object, so you can fill it up in the parameters list as well. so you can use both arguments fully. This cast is not needed for production environment, it is useful for development and would not yield any benefit when the site is live - it will work just as well without it, it is actually an extra operation.